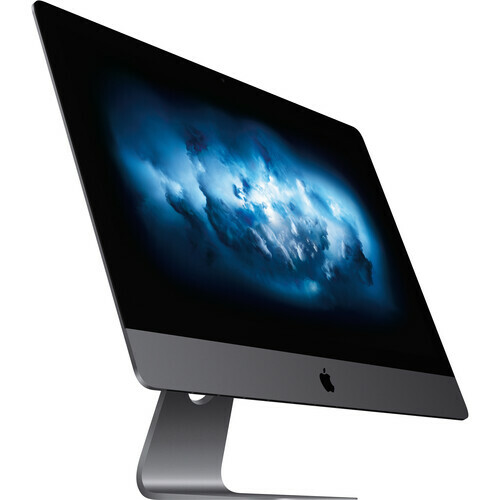 Featuring a 2.5 GHz Intel Xeon W 14-Core processor, the iMac Pro is designed to handle intensive professional workflows, such as photo, video, 3D animation, music, science, and software development. The iMac Pro also has a 2TB PCIe SSD, which has a 3.3 GB/s write speed and a 2.8 GB/s read speed, for loading huge files and launching apps faster. An iMac with 4 cores is remarkable enough. But an iMac with 14 cores is an entirely different creature. Add Turbo Boost speeds up to 4.3 GHz, and the iMac Pro has the power and flexibility to balance multi-core processing with single-thread performance. With AVX-512 vector instructions and a cache architecture, the processor handles even more data even more quickly, which means you can render images, edit up to 8K video, manipulate photos, create real-time audio effects, or compile your next app - all at lightning speed. Billowing smoke. Torrential rain. A wheat field in the wind. With up to 14 cores and Hyper-Threading, the iMac Pro lets you build and render particle systems of all kinds - static or animated, 2D or 3D.